To modify online store settings, customer login requirements, shipping, discounts and payment settings for the online store please see the instructions below. 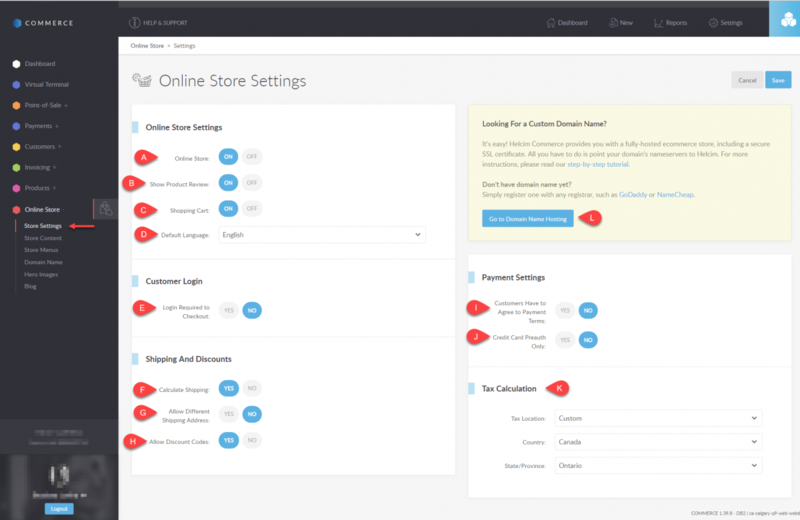 Select the Online Store tab and select Store Settings. Default Language – The language your online store will display in. To add other languages to this dropdown, please see the article on Language Settings. Calculate Shipping - this will enable the system to calculate the shipping costs based on your Shipping Settings. Allow Different Shipping Address – If enabled, this will allow customers to enter a different shipping address from the billing address. Although it can have somewhat of an impact on legitimate sales, by only allowing the shipping destination to be the same as the billing address you can greatly reduce your exposure to fraud. Fraudsters will often use the billing address of the stolen cardholder, but will put their own address of the shipping destination. Please see the article on preventing chargebacks for more information. Credit Card Preauth Only – If enabled, all purchases will actually go through as pre-authorizations only. This is used when you want to review the order before you agree to fulfill it and accept the payment. Once an order is reviewed, you can capture the transaction and collect payment. If you choose not to fulfill the order for security or other reasons, the pre-authorized amount on the credit card will be returned to the customer in 10-30 days depending on the customer's bank policy. This button will take you to the Domain Name settings. Please see the instructions on settings this up here.